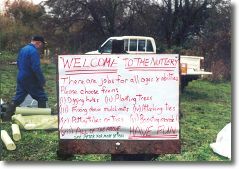 Welcome to Clare Nuttery ...where local people are creating a countryside site for everyone to enjoy. Clare Nuttery is owned by Clare Town Council on behalf of local residents. This small site (2 acres or 0.8 hectares) is being turned into a community woodland through the enthusiastic efforts of local people. Clare has very little woodland and none that is accessible to the public. At the Nuttery we are creating a woodland that we can enjoy now and our great-grandchildren will one day cherish. Hundreds of young trees have been planted over the last 5 years, boundary hedges are being restored and a large pond has been given a new lease of life. There are paths winding through the trees, connecting two open glades and creating a lovely place to walk the dog, listen to the birds or have a picnic. Clare Nuttery is located behind the cemetery, which can be reached from the High Street opposite the church. From the cemetery chapel, the Nuttery can be found by crossing to the top left corner of the field. Why not combine a visit to the Nuttery with a walk around the Clare Circular Footpath? The Nuttery is only accessible on foot but the ground is level and there are no stiles or gates to negotiate. In winter the paths can be muddy. Clare Nuttery is a part of the DedhamVale Area of Outstanding Natural Beauty (AONB) and Stour Valley Project. The project works with local communities and landowners to help them improve their local environment. The project area stretches from near Manningtree to the Cambridgeshire border.